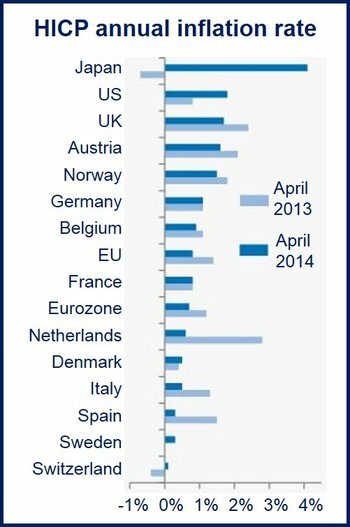 April HICP inflation increased in 13 of the 16 advanced economies, according to The Conference Board. HICP stands for the Harmonized Index of Consumer Prices, they are measures of consumer price inflation based on EU (European Union) definitions and have been standardized across several countries. Japan’s inflation grew from 2% in March to 4.1% in April, the highest one-month increase, followed by Sweden (-0.4% to 0.3%) and the US (1.2% to 1.8%). Switzerland, Spain Sweden emerged from March’s deflationary territory to positive inflation numbers in April. In Belgium (0.9%) and the UK (1.7%) inflation stayed the same, while Norway reported a slight decline (from 1.8% to 1.5%). There were concerns earlier this year that deflation was beginning to creep into the non-peripheral northern European nations, such as Sweden and non-EU Switzerland. Swedish authorities had been caught by surprise at March’s inflation slide. Dutch economists predict price falls in the coming months as the Netherlands’ population struggles with loans close to 250% of disposable income. Nearly 25% of Dutch mortgages are in negative equity and property prices are falling. Switzerland, Sweden, the US and Japan are the only nations where inflation in April 2014 was higher than in April 2013. Annual HICP-based price rises were 1% lower in April in 10 of the 16 economies, and with the exception of Japan below 2% in all of them. Annual inflation in the Eurozone fell to 0.5% in May, slipping further away from the European Cental Bank’s 2% target. On Thursday, the ECB reduced interest rates in a move aimed at preventing a growing Eurozone deflation threat. The ECB’s benchmark interest rate was cut by 10 basis points to 0.15%, its marginal lending facility interest rate fell to 0.4%, and the interest rate on the deposit facility went right down to minus -0.10%. The Bank of England’s Monetary Policy Committee, which voted on Thursday to keep its benchmark interest rate at 0.5%, is becoming split regarding when to increase it. Governor Mark Carney says rates will stay low for some time to come, while other MPC members are calling for earlier hikes.